World Cinema Paradise: September Storm is a real oddity in that the vogue for studio-produced 3-D features had completely dried up by 1955. How did it come to be made in 3-D? Robert Furmanek: There were some successful 3-D reissues in late 1957/1958 (Creature from the Black Lagoon and It Came from Outer Space, plus House of Wax with Phantom of the Rue Morgue), and producer Edward L. Alperson felt there was still some interest in the process. Alperson had an interest in 3-D going back to 1952 with Bwana Devil. September Storm was produced independently and test screenings went very well so it was eventually picked up for release by Fox. WCP: I imagine it must have been much more difficult shooting in dual anamorphic than spherical widescreen, or was it shot flat and converted to CinemaScope, via the SuperScope system (and like Super 35 in more recent years)? Furmanek: It was shot full-aperture with the Natural Vision rig and the anamorphic negatives were extracted optically by special effects wizard Ray Mercer and Deluxe labs. WCP: What were some of the unique challenges for the filmmakers, and for you in restoring it? Could you theoretically, created alternate widescreen versions while you’re at it? Furmanek: If the original open-matte camera negatives survived, we could create a widescreen version in various aspect ratios but the only existing 35mm left/right elements are the conformed anamorphic CinemaScope version.The usual color fading plus various levels of vinegar syndrome in different reels presented some major technical obstacles. But Archive Technical Director Greg Kintz doesn’t give up easily (check out Gog) and literally works miracles in creating a flawless 3-D master! WCP: The color restoration on Gog truly is amazing. I’ve read that. at least 20-odd years ago, the only known 3-D elements were held by the Library of Congress. Is that were you’re sourcing your materials? Furmanek: No, the Library of Congress does not have 3-D elements. We acquired the 35mm anamorphic negatives from the copyright holder. WCP: Was it stereophonic as well? Do those elements exist? Furmanek: No, it was released mono optical only. Furmanek: Most major cities played the 3-D version and it went flat for sub-run and smaller towns. WCP: Was the film ever broadcast on commercial television, or syndicated in its 2-D version? I don’t ever recall seeing it anywhere. Furmanek: It was syndicated for many years in a flat, murky 16mm pan and scan print. From the havoc that created on the compositions, you would never know they spent ten weeks filming on location in Majorca! It has not been seen anywhere in 3-D since 1960. WCP: Did you acquire the rights from Fox, or are they held elsewhere? Furmanek: Fox only distributed the film in 1960. The rights belonged to producer Alperson and have changed hands many, many times over the past five decades. We tracked down the current owner and they didn’t even know it was a 3-D film. Thankfully, they still had both left/right 35mm elements. It’s extremely fortunate that one side wasn’t junked over the past 50 years. WCP: It seems like you have your work cut out for you in this sense: technically and historically: it’s a very significant film, yet it’s also a movie very few people today have seen or are even aware of. How do you sell a title like this, which requires such special handling? Furmanek: Just like our 3-D Blu-ray release of Dragonfly Squadron, it will sell based on the pure rarity. Many people have expressed interest simply because they’ve never seen or even heard of the film. WCP: Kickstarter seems ideally suited to projects like yours. How’s it going so far? Does that look like the future for the remaining classic 3-D titles still unreleased on 3-D Blu-ray? Furmanek: Incredibly well. We’re halfway through the campaign and have raised 90% of our goal. That’s pretty remarkable considering just a few years ago, I couldn’t interest anyone in releasing our titles. You should see some of the rejection letters. My favorite is from Criterion where they casually dismissed 3-D Rarities as “not interesting.” Flicker Alley has done very well with the Blu-ray and that’s been our biggest seller! WCP: What can you tell us about It Came from Outer Space? This is a Universal Home Video release, or is it being sub-licensed? And what does this suggest for a possible release of Revenge of the Creature as well? WCP: Like a lot of people, I first saw It Came from Outer Space at a college campus screening in the 1970s, via a 16mm anaglyphic non-theatrical print. Needless to say, this is going to look a whole lot better than that…. WCP: Over on the Classic Horror Film Board, you’ve discussed how impressive the film’s stereophonic sound presentation was back in 1953, and how great it’s going to sound on Blu-ray. Could you tell us a little bit about how that sound was originally presented, how it’s different from past television and home video versions, and what it will be like on Blu-ray? Furmanek: In theaters, it was played back in sync with the picture on a separate full-coat 35mm magnetic dubber. Previous home video releases have used a modified and very compromised two-channel mix that was created in the 1990s. This is the first time people will experience at home what audiences first heard in 1953 and it’s going to knock you out. It was only the sixth feature released in stereo (First Year of Stereophonic Motion Pictures – 3dfilmarchive) and the sound is very directional. The score is amazing in discrete three-channel and the explosions will shake your house! 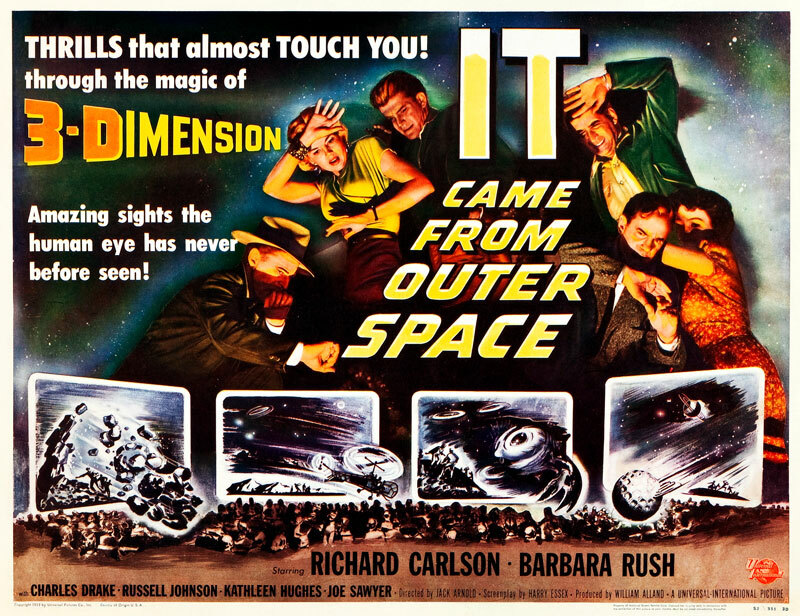 WCP: General audiences today would probably find It Came from Outer Space rather campy, but I regard it as one of the very best ‘50s sci-fi films, unlike anything that came before and after it. From the 3-D standpoint, which few have been able to see properly presented in more than 60 years, what’s particularly interesting and innovative about its staging? Furmanek: Both Greg and I feel this is one of the strongest 3-D features with terrific performances and a top-notch script that holds up amazingly well today. Jack Arnold had a great eye for stereoscopic compositions and his use of layering is quite impressive. WCP: Have the 3-D elements been kept in good condition? Are there any special challenges for you? And will you be adjusting misaligned shots on either of these titles? 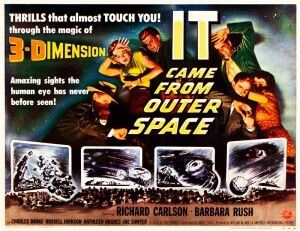 Furmanek: This was Universal’s first 3-D production and they were rushing to try and beat House of Wax into theaters. They didn’t succeed, and there were quite a few editing mistakes in the film (with reversed images) that we have fixed. Also, the vertical alignment was all over the map from shot to shot and we’ve fixed those issues as well. You’ll be seeing the film looking better now than it did in 1953. WCP: Of the remaining classic 3-D still unreleased on Blu-ray 3-D, what’s your Holy Grail? Which ones would you most like to see restored, and are the studios involved cooperating? I guess it would be fair to say Wade Williams (of Robot Monster and Cat-Women of the Moon) lies at one extreme; who’s been the most helpful? Furmanek: Because of my 35-year friendship with Jerry Lewis, I would love to fully restore Money from Home. We came very close last year and even did a 15 minute 3-D demo which played to a very receptive audience at the Museum of Modern Art in New York. Jerry was on board with the project but unfortunately, we encountered some extremely frustrating obstacles from one individual who had the power to kill it. But I don’t give up easily, so never say never! I can’t disclose specific titles at this time but I have to say that Richard Lorber, Frank Tarzi, Bret Wood and the entire team at Kino-Lorber have been fantastic in securing licenses for some amazing titles. Get ready for some reel stereoscopic gems coming to 3-D Blu-ray in the next few years! WCP: How can fans of classic 3-D best support your efforts? And would you care to hint at other titles we might see this year or during the first half of 2017? Furmanek: We’re currently preparing two Silver Age titles for release, A*P*E (not to be confused with King Kong) and The Stewardesses. Honestly, the best way to get more vintage 3-D onto Blu-ray is to support the new releases. If a title doesn’t sell enough to at least break even, it will make it that much more difficult to pursue additional licenses. Even if it’s a movie you’ve never seen or a genre that doesn’t normally interest you, give it a shot. I believe that more often than not, you’ll be very pleasantly surprised. The Golden Age 3-D titles are far better than their reputation. You can read more about September Storm and the campaign to save it HERE.